When using the galleries attached to these chart command buttons on the Insert tab to preview your data as a particular chart style, you can embed the chart in your worksheet by simply clicking its chart icon. If you’re not sure what type of chart best represents your data, rather than go through the different chart type buttons on the Ribbon’s Insert tab, you can use the All Charts tab of the Insert Chart dialog box shown here to try out your data in different chart types and styles. You can open the Insert Chart dialog box by clicking the Dialog Box launcher in the lower-right corner of the Charts group on the Insert tab and then display the complete list of chart types by clicking the All Charts tab in this dialog box. 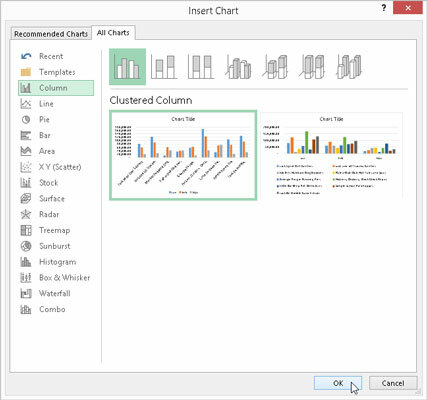 Insert Chart dialog box with the All Charts tab selected where you can preview and select from a wide variety of chart types and styles.